Ten boats carrying 50 volunteers gathered over 30 bags of trash and even a tractor-trailer tire; there must be more awareness of the fact that trash generated in the city ends up in the sea. 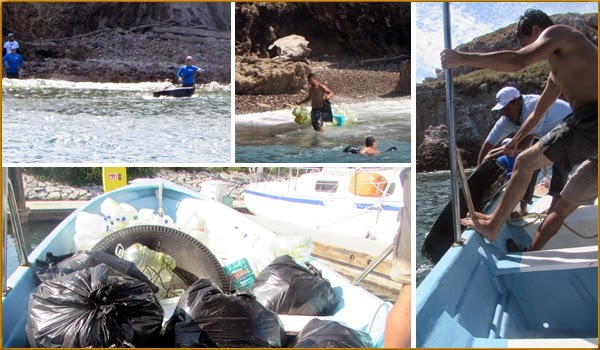 The first official Beach Cleanup Network event for the Islas Marietas brought to light several topics worthy of further analysis, in particular the need for more public awareness regarding waste management. It also highlighted the commendable work of those who volunteered for the cleanup project. Contrary to how it may appear, the vast majority of the trash is not left behind by the tourists who visit the National Park, in spite of the increase in visits thanks to the promotion of Playa del Amor. The trash arrives at the Islas Marietas courtesy of the area’s communities. There were a total of 10 boats carrying some 50 people from the Coral del Risco Tourism Services Coop and Punta Mita Adventures. Together they gathered over 30 large black trash bags mostly filled with plastic bottles, though they also recovered rusted metal rods and even a tractor-trailer tire. The islands don’t have much sandy beach area, however, because of their topography there are plenty of areas unreachable by boat. This is where the ingenuity, persistence and resourcefulness of the tourism service providers proved invaluable, as they swam through jellyfish, rocks and strong marine currents to gather the trash, and even used Paddleboards to recover the tire. The surprising passion and enthusiasm of the men, women and youths that braved the currents and committed themselves fully to this cause is worthy of a mention, as is their clear objective of caring for the Islas Marietas, which are among the Riviera Nayarit’s most precious icons. The work required great skill and knowledge of the ocean currents by the volunteers in order to enter and leave the water and the beaches with full trash bags and miscellaneous objects. However, everyone can participate in the island cleanup by not littering the streets, rivers, streams and beaches. Join us in our efforts! This cleanup will eventually include scuba diving in order to clean the seabed as well, since snorkeling and diving are very important activities in this area.